Yesh Atid chairman blasts UN report accusing Israel of apartheid. 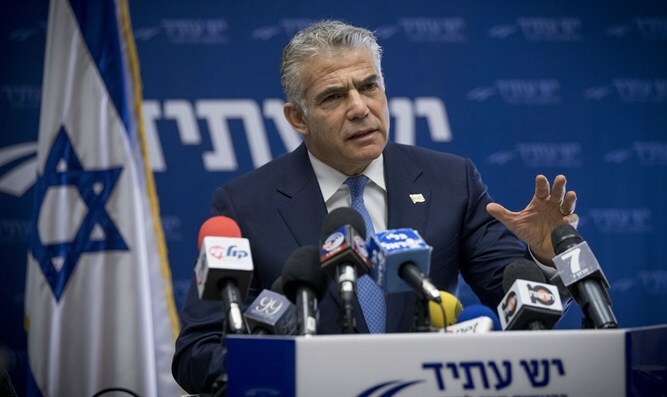 Yesh Atid chairman MK Yair Lapid on Wednesday evening blasted a UN report accusing Israel of imposing apartheid on Arabs in Judea and Samaria. The entire report "is full of hatred and anti-Semitism", Lapid said. “Instead of an organization which defends freedom, democracy and liberal values, the UN has turned into a collaborator with terrorist organizations. Does anyone think it makes sense that a UN agency in which Syria and Sudan are members will preach morality to the State of Israel - the only democracy in the Middle East that protects the rights of its minorities and provides humanitarian aid to its enemies?” he continued. “Europe and the United States must make it unequivocally clear that as long as the campaign of incitement by the UN and its institutions against Israel does not stop, they will stop supporting this organization that has long ago ceased to fulfill its role." Lapid added, "This week I held a series of meetings in Washington aimed at stopping the funding to the UN and convincing the United States to withdraw from the UN Human Rights Council and its annexes, and I will continue to do so until that happens." Earlier on Wednesday, UN Secretary-General Antonio Gutteres distanced himself from the report, which was authored by the UN Economic and Social Commission for Western Asia (ESCWA). The study concluded that "available evidence established beyond a reasonable doubt that Israel is guilty of policies and practices that constitute the crime of apartheid." One of its authors is Richard Falk, a former special UN rapporteur on Palestinian human rights who in the past praised the Hamas terrorist organization and compared it to the French resistance during World War 2. Falk has a history of anti-Israel statements, and had compared Israelis to Nazis.